You probably know the musical comedic genius of Team Starkid from A Very Potter Musical and its sequels. What? You’ve never seen A Very Potter Musical??? Well, I’ll have to blog about that some other time, because it’s awesome. Draco is a girl in drag and Zac Ephron is a [SPOILER!] and Harry Freakin’ Potter is played by a pre-Glee Darren Criss (aka Blaine Warbler). 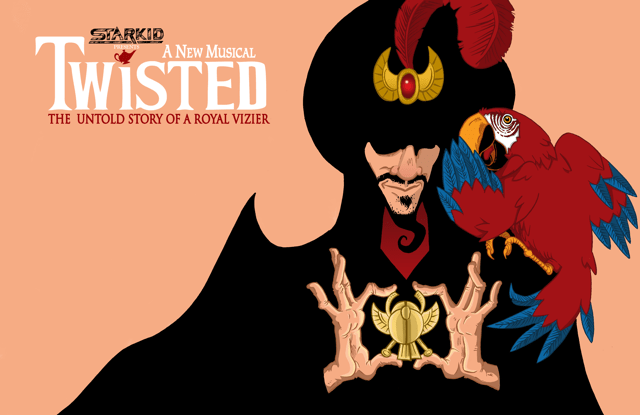 But today I’m fangirling about StarKid’s latest production, Twisted: The Untold Story Of A Royal Vizier. It parodies both Wicked and Disney’s Aladdin, as indicated by the promo poster. It’s as affectionate and irreverent a parody as any of StarKid’s other works. Ja’far (not to be confused with the copyright-protected Jafar) gets the Elphaba treatment as the virtuous scapegoat for all the kingdom’s problems. His “scheming” is really applied poli sci, his “sorcery” is advanced science, and his “evilness” is a desire to rid the streets of criminals who steal bread from simple hard-working bakers. 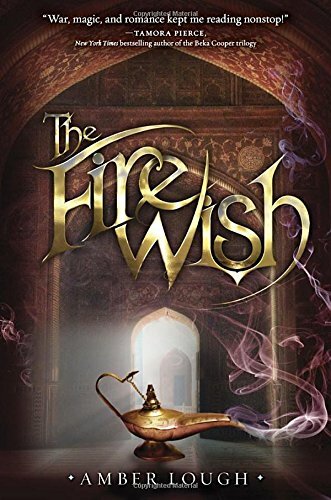 He also shares an unexpectedly poignant romance with Scheherazade of One Thousand and One Nights fame. Aladdin, tragically orphaned at 33, is a perfect satire of a douchy hipster trustfund baby who’s too cool to work for a living like everyone else. The Princess is every 16-year-old rich white privilege-checking Social Justice Warrior on Tumblr who dreams of saving the world but has a lot to learn about how it actually works. Since her name is never mentioned, I’m sure she is not the licensed Disney Princess Jasmine. Got a couple hours? Watch the whole thing! Judge Sotomayor comes to Sesame Street to explain the word “career.” She describes “career” as “a job that you train for and prepare for and plan on doing for a long time.” Muppet child Abby Cadabby immediately says she wants a career as a princess. Judge Sotomayor gently breaks it to Abby that “pretending to be a princess is fun, but it is definitely not a career.” She tells Abby that real careers that a girl like Abby can train for in real life include “a teacher, a lawyer, a doctor, an engineer, and even a scientist.” In the end, Abby decides that when she grows up, she wants to follow Judge Sotomayor’s footsteps and earn a career as a judge. So, what did a self-described lover of all things pink and purple and princessy think of this little PSA? I loved the fact that Judge Sotomayor did affirm that pretending to be a princess is fun. It is fun (if you like that kind of thing), and it is just pretend. That’s why I don’t think it’s all that big of a deal for little girls to play princess any more than it is to play knights or dragons or zombies or space aliens or whatever. Contrary to popular belief, it’s not that hard for kids to learn the difference between make-believe and reality. You can encourage imaginative play and still make sure children understand the difference between fantasy and reality. Which is and isn’t what Judge Sotomayor did on Sesame Street. How many little girls or little boys are really going to grow up to become Supreme Court justices? You can only have nine at any given time, and one of them has to die or voluntarily resign for a spot to open up. So, in a way, Judge Sotomayor just replaced Abby’s completely unattainable fantasy with an almost completely unattainable fantasy. A kid who’s capable of imagining herself as a fairy tale princess, something that’s not even real, is also a kid who’s capable of imagining herself as an engineer, a scientist, a doctor, a lawyer, a teacher, or a judge. Sure, her imaginings are probably as close to the real thing as her princess fantasies are to the life of The Lady Louise Windsor. But maybe as she grows up and she learns more things about the realities of those careers, she’ll keep the ability to imagine herself in them. The vision will change, but the power to believe it won’t. When I was young enough for Sesame Street, I loved imagining I was a princess. And a dinosaur. And an alien. And a cowgirl. And a mermaid. And a fairy. And a Bedouin warrior. And a centaur. And an officer on the USS Enterprise. And Laura Ingalls Wilder. And Sacajawea. But most of all, I loved imagining that when I grew up, I’d be able to take all of my imaginings and show them to the world. Hey, what do you know? Playing pretend did turn into a career. I’m not talking about Kate, Diana, and Grace. I’m talking about the romanticized idea of a princess in popular media. The mythical concept of Princess that never has and never will exist in reality. I love outrageous, opulent ball gowns. Being born to wealth and power sounds like a beautiful dream. A castle seems pretty cool compared to my tiny apartment. There’s something very appealing about being thought “the fairest in the land.” And I effin’ love pink and purple. I can hear the freakouts already. Herp patriarchy! Derp weak dependent submissive women! Hurr durr pink and purple!!! Calm down. I believe young girls should be taught to make their own way in the world. That they should be just as conditioned as boys to become assertive, self-confident adults who take on the world themselves and don’t sit around waiting for someone to hand it to them. That their sense of worth should be in themselves, not in a potential or current romantic partner. But what the hell does any of that have to do with pink and purple? That frilly pink or purple ball gown I dream of wearing? Maybe I want to acquire it with a fortune of my own making. That castle in the sky? Maybe I want to storm it in shining armor and wear my ball gown at a celebration for my victory. Or maybe I was born in the castle because my mom is a queen in a long line of matriarchs. O Noes! Princesses = patriarchy!!!! :O Well, guess what. It’s my queendom. It exists in my mind. I can make it whatever I want. If I want “princess” to mean a woman who holds great power and uses it for good, it can. If I want “princess” to mean a woman who prefers a sword to a scepter, it can. If I want “princess” to mean a woman who prefers a pen to a sword, it can. If I want “princess” to mean a woman who wanted power and worked for it and claimed it, it can. If I want “princess” to mean a woman whose power was granted to her at birth because she bears the blood of hundreds of powerful women before her, it can. If I want “princess” to mean a woman who doesn’t need a prince, but goes out and wins one because she wants one, it can. If I want “princess” to mean a woman who goes out and wins another princess, it can. So when you see me in my pink ruffles, don’t assume I’m less driven and ambitious than the woman in a pantsuit. When you see my twirly floral miniskirts, don’t assume I’m waiting for a prince to call me pretty (or call me, period). And someday when I have a daughter and I call her my beautiful princess, don’t assume that I don’t also call her smart, strong, creative, hard-working, compassionate, and brave. Because that’s my idea of a princess. And if I choose, I can be all of those things while decked out in pink and purple.